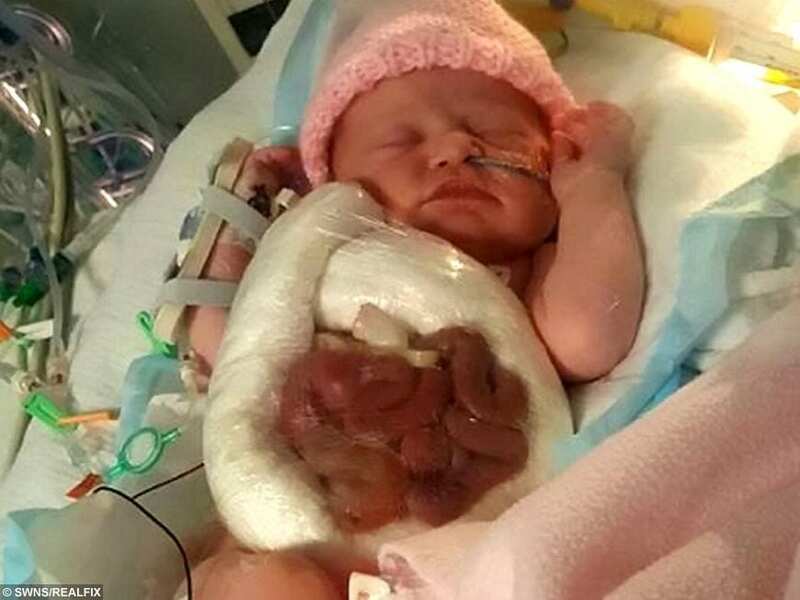 A mother has shared this powerful photo of her ‘inside-out’ baby – born with her intestines on the OUTSIDE. 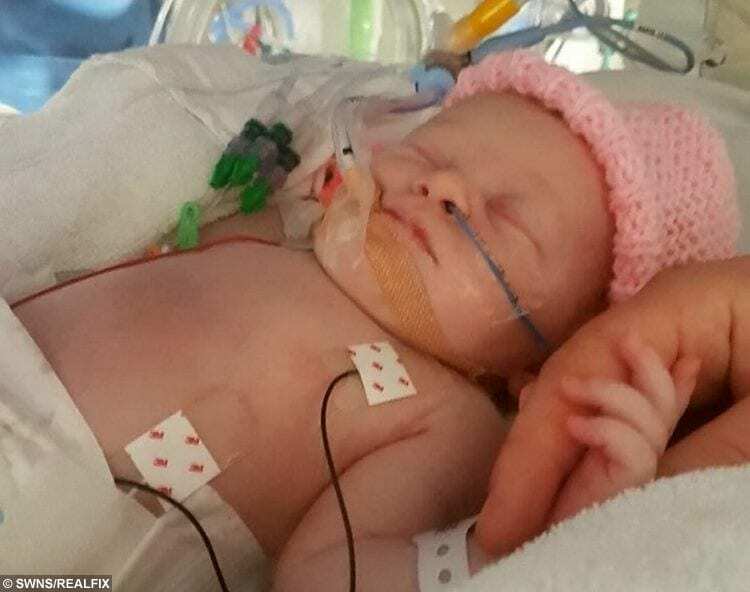 Little Ava-Rose Nightingale was born with gastroschisis, where her intestines grew outside her body because her abdominal wall didn’t completely form before birth. 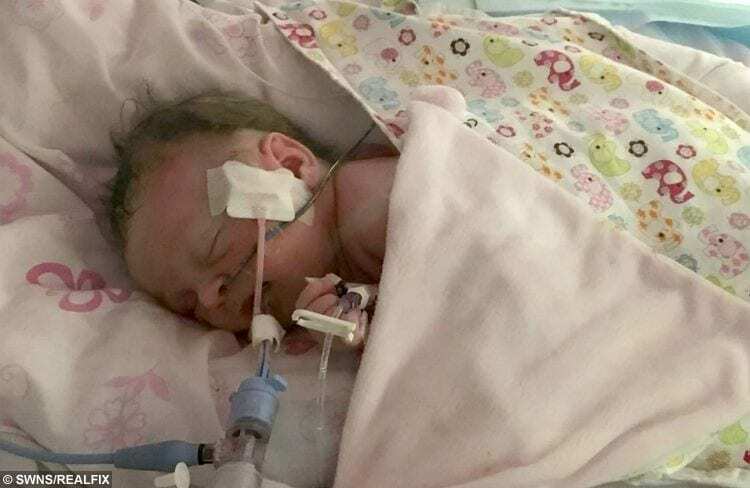 The incredible photo – taken minutes after she was born – shows her organs spilling over her little body which was wrapped in CLING FILM to stop infection. She was then whisked off for a successful three-hour operation and mum Chloe Walters, 21, could only bring herself to look at the graphic snap two weeks later. Chloe is now sharing the gory photo in a bid to raise awareness of the rare condition which affects 1 in 3,000 babies and wasn’t picked up at her first scan. The diary farmer, from Johnstown, Carmarthen, Wales, said: “It was such a scary experience. “They told me I wouldn’t be able to hold her but I was so upset I got to for five seconds. 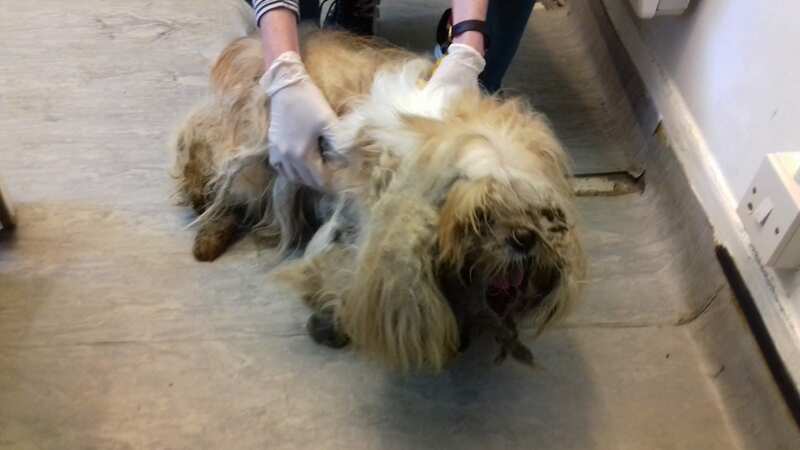 “Her intestines were on her and they looked bigger than her. It was like huge blobs of flesh and red. “But I didn’t even have time to rest before the doctor was in with me explaining the risks of her surgery. “Of course they had to tell me but it was really scary having to sign her life away just after she was born. “Handing her over was really hard. The family got to see her all wrapped up in clingfilm just before the operation and someone took a photo. “They wrapped her all up in the cling film – just like the stuff from the kitchen – to keep them clean and moist and to keep her warm. “I couldn’t believe it that this piece of kitchen cling film was keeping her going before her operation. “I couldn’t look at the photo. At the time I didn’t want it and to see it would have broken my heart. “But after two weeks I wanted to see it. I built up the courage to have a look and while it was horrible it shows how far she has come. Little Ave-Rose with her dad Scott Nightingale. Chloe had a totally normal 12 week scan but medics noticed an abnormality at a private 16-week one. She describes seeing “scribbles” around her body – her organs spilling out of a hole in her body. “It looked like lots of loops all around her body,” said Chloe. She immediately went to A&E where doctors diagnosed gastroschisis and she endured endless scans throughout her pregnancy. 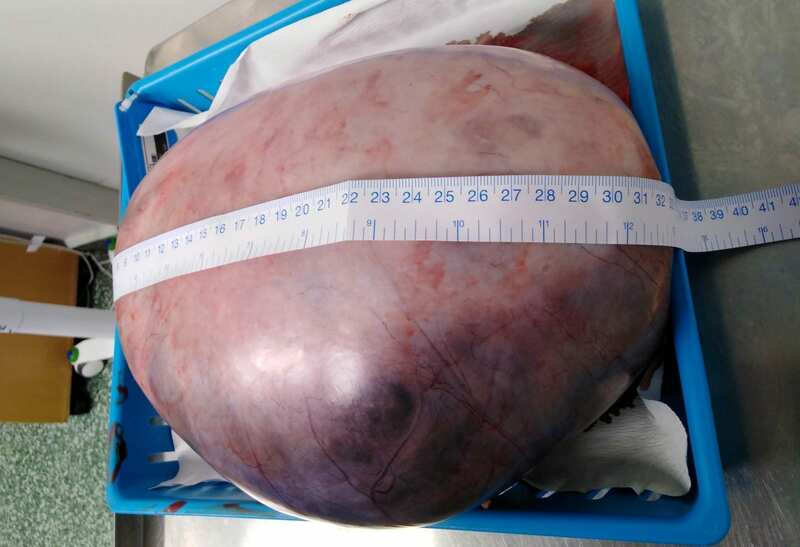 And to add extra worry, she had anterior placenta – where the placenta is on the front wall of the womb – she she didn’t feel a single movement throughout her pregnancy. 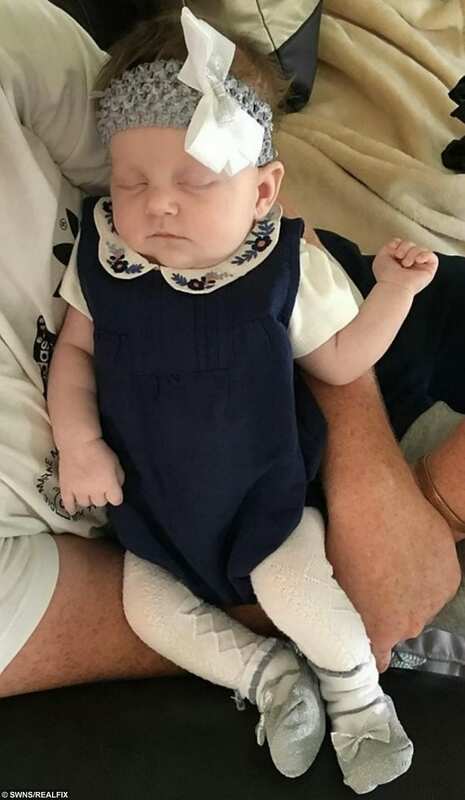 Little Ava-Rose was born via natural delivery on May 21 at University Hospital of Wales in Cardiff weighing 6lb 8oz – surrounded by a dozen experts. Tearful Chloe got a “five second cuddle” before her daughter was whisked off, wrapped in clingfilm, and prepared for surgery by Dr Kim Hutton. Little Ave-Rose in hospital after her op. 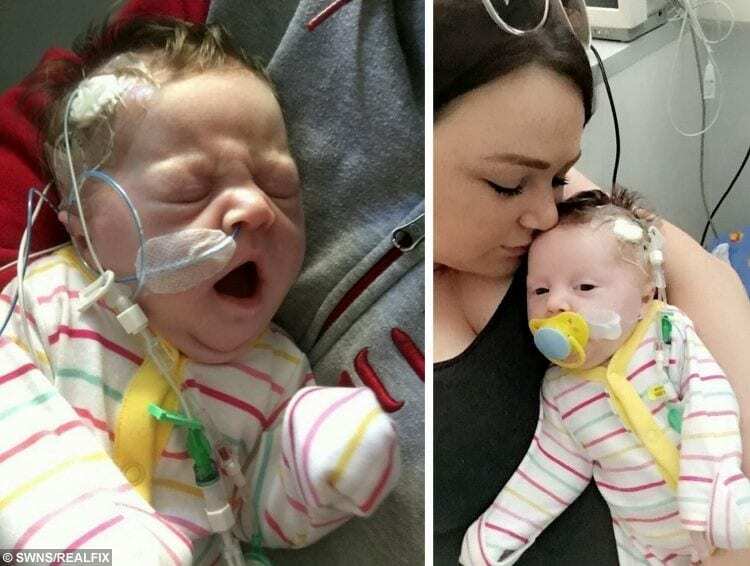 After doctors successfully put her organs back in place she was still on oxygen for seven days after she “forgot how to breathe” thanks to the morphine and op. 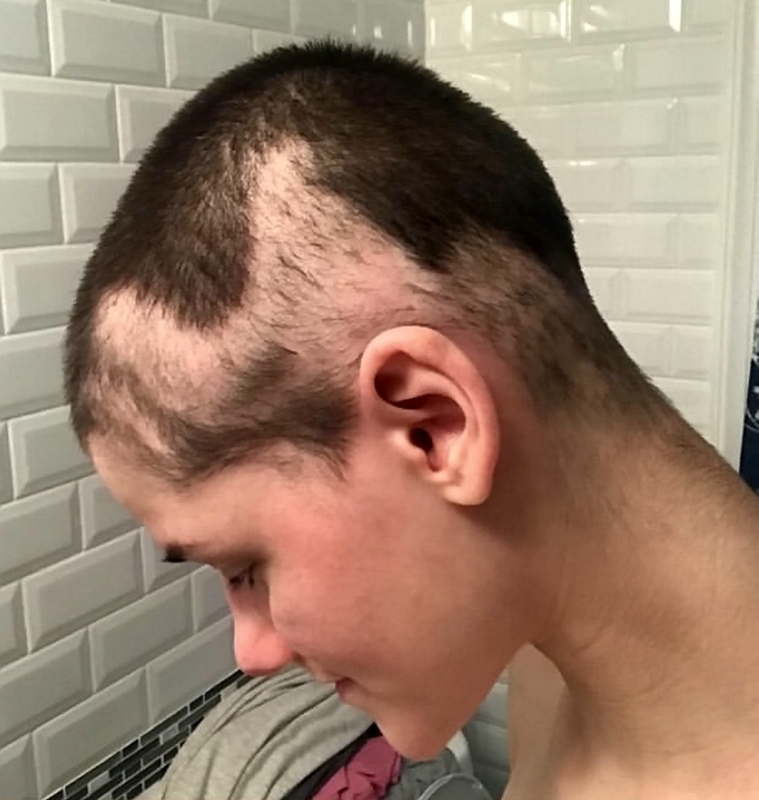 She was fed through a long line into her head – forcing doctors to shave her hair – for 14 days before she was slowly introduced to milk. After seven weeks in hospital she was finally allowed home in late-June and is now happy and healthy with Chloe and dad Scott Nightingale, 23. Chloe plucked up the courage to post a photo showing Ava-Rose’s insides covering her entire front on Facebook to raise awareness. Ave-Rose as she is now. Her message – seen by hundreds of mums – said: “Unfortunately the UK doesn’t recognise this day yet but as this affects 1 in 3000 babies with no known cause. Hopefully this will change! “Gastroschisis normally occurs on boys and mothers under the age of 20 at my 16 week private scan I was told my baby had gastroschisis after regular appointments and check ups I was told there was a chance I could go into labour anytime from 32 weeks as this was common with babies with this defect and also the chances of stillborn became higher at 39 weeks 4 days. “Ava-Rose was born. 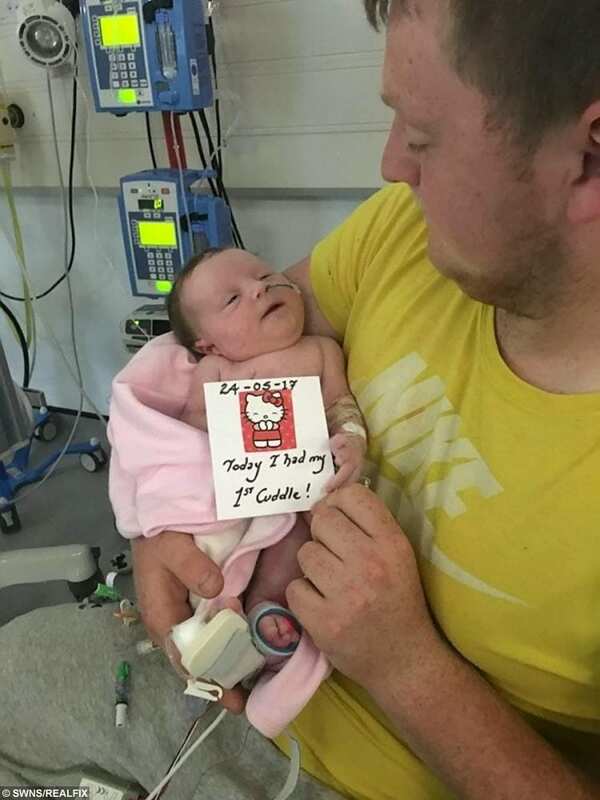 At one hour old she was sent down for operation that saved her life. Thanks to doctors at Cardiff Heath hospital. I couldn’t thank them enough for saving are little girl.